Mischief and measurement go hand in hand in this hilarious story about a beaver trying to fix the leak in his clam and the bull-frog who plays a big joke on him. 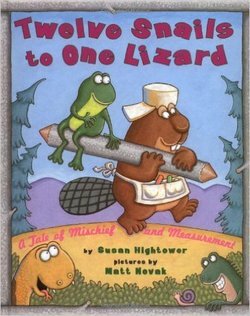 What do twelve snails, three lizards, and one hungry snake have to do with Milo Beaver's leak and Bubba Bullfrog's joke? Well, it just so happens that these pond-side animals are the perfect tools for measuring ... if only Milo can get them to stand still in a very straight line! Wonderfully funny art, a jolly text, and comic-like pages make this an ideal classroom and story hour title. A unique list of measurement facts about the animals featured in the book is included.